An accident could happen in any power station as a result of technical defect or human error, releasing large quantities of radioactivity into the environment. 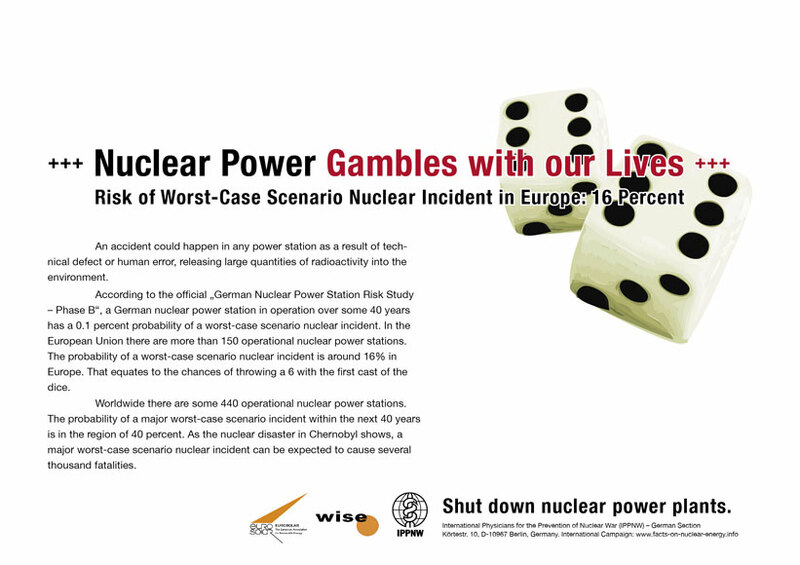 According to the official "German Nuclear Power Station Risk Study - Phase B", a German nuclear power station in operation over some 40 years has a 0.1 percent probability of a worst-case scenario nuclear incident. In the European Union there are more than 150 operational nuclear power stations. The probability of a worst-case scenario nuclear incident is around 16% in Europe. That equates to the chances of throwing a 6 with the first cast of the dice. Worldwide there are some 440 operational nuclear power stations. The probability of a major worst-case scenario incident within the next 40 years is in the region of 40 percent. As the nuclear disaster in Chernobyl shows, a major worst-case scenario nuclear incident can be expected to cause several thousand fatalities.